Paul Hostovsky is the author of five books of poetry, most recently Naming Names (2013, Main Street Rag). His poems have won a Pushcart Prize and two Best of the Net awards. He has been featured on Poetry Daily, Verse Daily, The Writer’s Almanac, and was a Featured Poet on the Georgia Poetry Circuit 2013. To read more of his work, visit him at www.paulhostovsky.com. Certainly the fridge door is a place of honor, but the “highest honor/ a poem can aspire to”? At first this reads like sarcasm. And the poem seems to take itself so seriously, giving a triumphant speech about its own achievement. It smacks of the self-important posture often assumed by art considered “high,” which is why we chuckle – the fridge is decidedly hodgepodge and common. 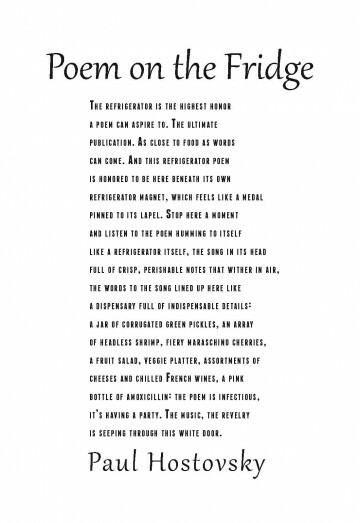 But then the poem changes focus, “the song in its head” changing from the physical words “lined up here” to what they signify: “a dispensary of indispensable details” observed from surrounding life. Happily there is lots of food and a little medicine. Essential stuff is “seeping through this white door” as well as the white page that holds the words to the poem, alive and infectious. This refrigerator poem is so proud, so honored to have that magnet “like a medal/ pinned to its lapel.” It stands very straight against the fridge’s fuselage, at attention like a general who has just been awarded his fourth star. The typeface for the body therefore needed a straight spine and squared shoulders; Franchise delivers, adding its distinctly medal-like colons for good measure. The title needed a bit more curve, something worthy of a personal invitation to “Stop here a moment/ and listen to the poem… It’s having a party.” The kind of script that might issue from the hand of a very upright, formal being trying to let down their hair a little: Gabriola.